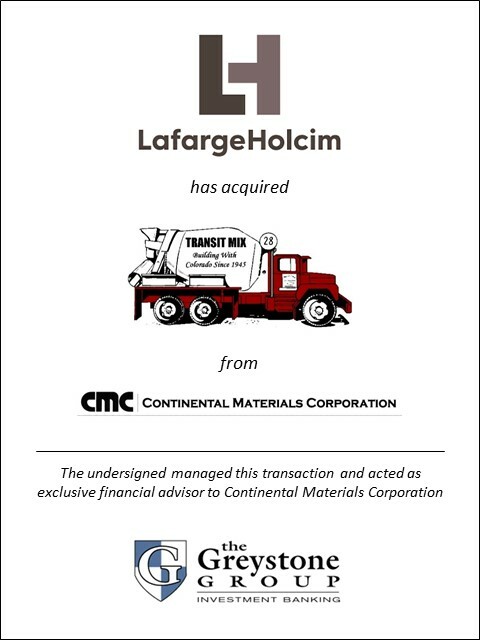 SOUTHLAKE, TEXAS (February 1, 2019) – Greystone Group, a leading investment bank focused on the construction materials industry, announced today that it advised Continental Materials Corporation on its divestiture of Transit Mix Concrete Co. to LafargeHolcim. Transit Mix is a leading supplier of building materials in Colorado, with a leading ready mix position in Colorado Springs and Pueblo. “We have enjoyed a relationship with Jim Gidwitz and Continental Materials Corporation since before the inception of our firm and we were fortunate to have an opportunity to advise them on the sale of Transit Mix,” said Tim Oitzman, President of Greystone Group. Founded in 1945, Transit Mix operates six ready mix plants in Colorado Springs and Pueblo, Colorado and is integrated with the Daniels Sand operation near Colorado Springs. Transit Mix recorded annual revenue in excess of $60 million and has more than 180 employees. Continental Materials Corporation is retaining its building supply and aggregates businesses in Colorado, which will be rebranded as Castle Rebar and Supply and Castle Concrete Aggregates, respectively. “When we decided to divest our only ready mix concrete business so that we could focus on expanding our core business, we engaged Greystone because of their industry knowledge and experience negotiating with all of the logical suitors” said Jim Gidwitz, Chairman and CEO of Continental Materials Corporation. Incorporated in 1954 and based in Chicago, IL, Continental Materials Corporation is a holding company focused on lower middle market manufacturing businesses. Within the HVAC industry, the Company operates in the Heating and Cooling segment as well as the Evaporative Cooling segment. Its construction products business is focused on the door segment and produces doors, frames, hardware, fixtures, electronic access and security systems. Continental Materials Corporation plans to continue to grow through a combination of organic growth with its current business units and the acquisition of additional North American manufacturing and distribution businesses. LafargeHolcim is the leading global building materials and solutions company. It has four businesses: cement, aggregates and ready-mix concrete as well as advanced solutions and products that include precast concrete, asphalt and mortar. Headquartered in Switzerland and with leading positions in all regions, LafargeHolcim employs approximately 80,000 employees in around 80 countries and has a portfolio that is equally balanced between developing and mature markets. In the United States, LafargeHolcim companies include close to 350 sites in 43 states and employ 7,000 people. Greystone is a considered a leading M&A advisor to the construction materials industry, having managed over 60 industry related transactions. Our focus on the construction materials industry allows us to provide unique and valuable insight to both our sell-side and buy-side clients. Since inception in 1996, we have developed unparalleled industry relationships and strong market knowledge which helps our clients achieve optimal results in their M&A transactions.